Western societies are shifting. Seismic changes, from the Brexit vote to the US election, challenged the status quo this year. Is this a global move? No, at least not for now. It is mainly confined to Europe and America. These highly successful societies are searching for a new narrative. Post-US elections, all eyes are turning to Europe. What are the key events to watch in Europe in 2017? If there is one thing to watch next year, it must be the three big elections in The Netherlands, France and Germany. They represent 56% of the Eurozone economy. They are three of the six founding members of the European Union (EU), who decided to set aside differences after the Second World War in the ambitious belief that joining forces would make them stronger. Together with Belgium, Italy and Luxembourg they signed the Treaty of Rome, which created the European Economic Community (EEC) and a common customs union in 1957. This will be exactly 60 years ago in 2017. Was it successful? Absolutely. The collaboration of the Netherlands, Germany and France made them rich. Very rich indeed. Since 1960, these countries have experienced impressive growth in real GDP per capita. Large parts of these countries were destroyed during the war. They rebuilt themselves, strengthened their economies, and have been flourishing for six decades. Largely due to deeper cooperation, these changes have been remarkable and unprecedented. This deep collaboration was so lucrative, that it made The Netherlands, France and Germany outperform the United Kingdom (UK) and the United States (US) over a 60-year period. The Netherlands, France and Germany did more than that. They ensured that large parts of society benefit from this economic growth. The countries implemented policies that distributed wealth more fairly: affordable first-class education, social security to cover for rainy days, and tax schemes that found the right balance between incentives to work harder for ambitious people while ensuring a decent income for the less fortunate. And the results are striking (see chart below). In the US, the poorest 40% of earners bring home just 16% of the national income, while the richest 10% earn a whopping 29%. In The Netherlands, France and Germany, the numbers are much smoother (the bottom 40% brings home 22%, top 10% around 23%). The UK is a bit in the middle, but trend-wise similar to the US. This explains in large part why income inequality and missing out on economic growth were big topics in the US elections and UK referendum. The European countries that will head to elections next year have done much better. 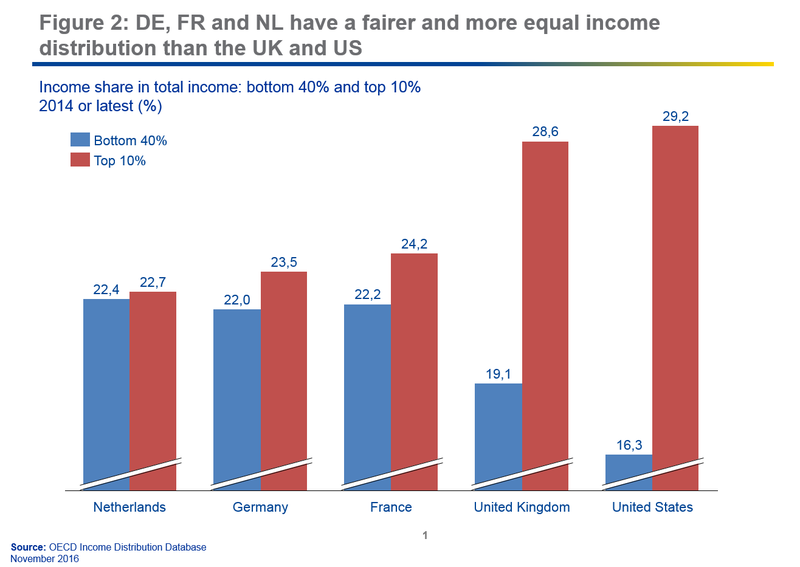 The Netherlands, France, and Germany have fairer and more equal income distribution than the US and UK. This is mainly due to the “European welfare model”, though long under fire, it might now appear to be just the right recipe to deal with the problems that globalization brings. The overall economic picture has changed tremendously in Europe over the course of 2016. 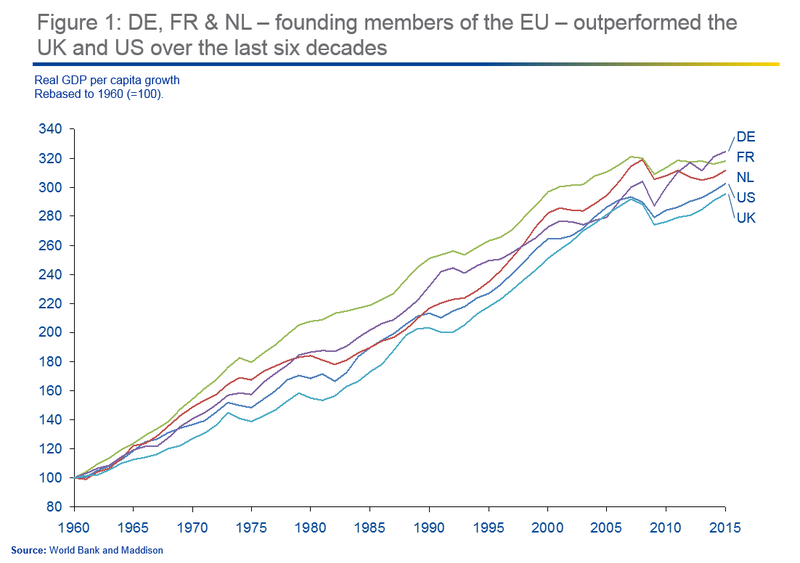 With the exception of Greece, all European countries have returned to growth. 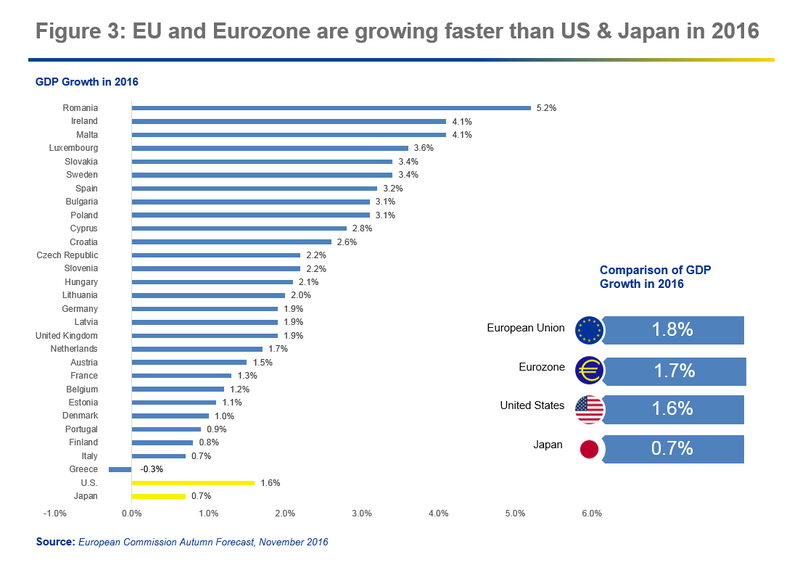 The EU (1.8%) and the Eurozone (1.7%) grew faster than the US (1.6%) in 2016. The unwavering political support of key Eurozone countries, such as The Netherlands, France and Germany, made the economic union and the euro survive the crisis successfully, despite many doomsayers. Europeans are starting to feel the effects of an improving economy and, therefore, concerns are shifting. 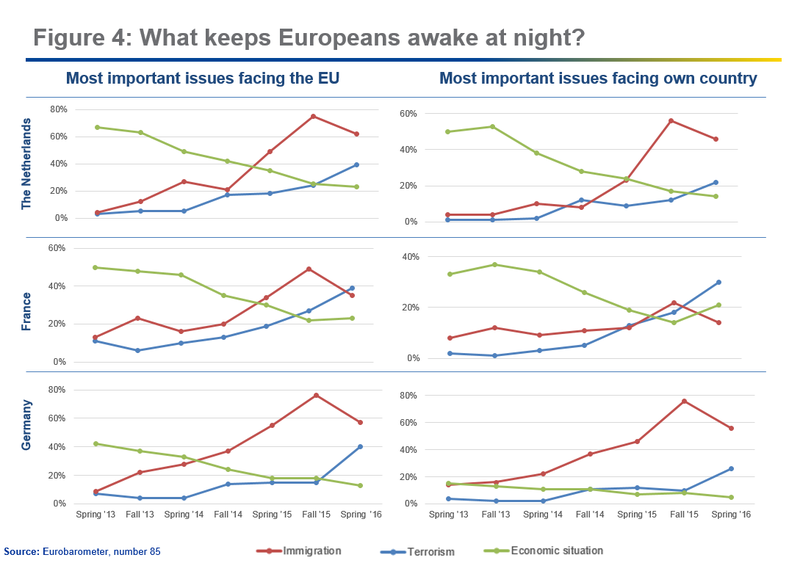 Before spring 2015, the number one concern in Europe was the economy. This has shifted rapidly and the top concerns today are ‘immigration’ (48%) and ‘terrorism’ (39%). This is what Europeans answered in the latest Eurobarometer, when asked what the two most important issues facing the EU and their own country are. The Dutch, French and Germans sound these concerns on both European and national level. This is what keeps them awake at night. These are the topics that are closest to their heart. In democracies, people point their leaders to the key topics they want to be addressed. Rightfully so. This means that politicians and policy makers must address these real concerns. By their very nature, immigration and terrorism are cross-border and need to be solved internationally. This is where European collaboration can show its benefits. Europe was able to curb the first wave of immigration over the course of 2015 and 2016. Immigration numbers went down dramatically. Terrorism is still a large concern, but European collaboration and information exchange can reduce the threat. The topics of immigration and terrorism, narrowly, and safety and security, broadly, bring back the essence of European collaboration. These were the core principles that started European cooperation 60 years ago. This is what people truly wanted. This has an emotional value. Fortunately, most people today have not known wars in Europe. Seventy years ago this was different. If you were a young European, you would have lost millions among your age group on the battlefield. The military graves across Europe show the tangible remains of hundreds of thousands of young French, Germans, American, British and soldiers of other nationalities. The debate will be again around the core values of Europe. Of course, we should stress the GDP per capital growth argument and better income distribution in the Netherlands, France and Germany versus the US and UK. But as people are emotional creatures, safety and security is what really matters to them most. This is what Europe has successfully delivered for many years. And this is being challenged at the moment. The election in the founding members will be about who will be able to offer these basic needs again. And explain this in a crystal clear manner. Obviously, there are many other topics that are relevant to watch in Europe next year: the aftermath of the Brexit vote, the finalization of the third Greek support package (the last remaining country under ESM or EFSF crisis support), US-Russia-EU relations, EU-Turkey relations, European Central Bank monetary policy and developments in financial markets. Anti-globalism, anti-trade and Euroscepticism are potential headwinds as well. All these issues will come together in the elections of the three founding members of Europe. The outcome will shape the direction of the debate. If something dramatic or unexpected happens, the founding members might gather again, as they did post-Brexit, and set the narrative for the coming years. So what is my take on these key elections? Well, as they say, “Making predictions is very difficult - especially about the future!” Nevertheless, it is certain that next year will be a crucial year and these elections will define Europe’s future. I strongly believe in the power of democracy and the wisdom of people. We are the guardians of the European project which has brought peace and prosperity to many. Citizens will ask for changes, which we should implement. But we should safeguard some of our hard-fought core values for the next generations: young Europeans, who have never seen war, and have never been stopped at a European border. This article reflects the author's personal opinion.